The word "cinema" mostly brings the aura of dream inside the minds of audience, who sail in the boat of that dream to reach their hopes and wishes. The cinema is the escape route for millions. Director Kaushik Ganguly’s quest for that dream through the mind of Pranabendu Das or the “Cinemawala” creates poetry on celluloid. The director is clearly influenced by the iconic movie of Satyajit Ray “Jalsaghar” (The Music Room) but definitely has a narrative which is unique and contemporary. The movie is based on a conflict between a past which has a glorious legacy and the present which is powered by technological advancement of time. Pranabendu Das (Paran Bandopadhyay) , the past , owns a single screen movie theatre “ Kamalini”, named after his separated wife. But with time and technological advancement, the era of single screen movie theatre is decaying and the age of multiplexes has arrived with the digitized version of cinema. Pranabendu Das is living on the glorious legacy and does not want to succumb to the pressure of time and due to this, his movie theatre is closed and deserted but maintained by his long time assistant Hari (Arun Guhathakurta).Pranabendu’s son Prakash (Parambrata Chatterjee) is the present and in disagreement with his father as he wants to continue with the new trend and renovate “Kamalini” for the new age version of cinema. The narrative continues with this conflict of past and present on the back drop of a family drama for the changing face of the dream on silver screen called cinema. “Cinemawala” is poetic. Every shot is beautifully crafted and blended with a perfect pace. Paran Bandopadhyay was a late entry in the film and television industry and improved with time brilliantly, giving his best performance till date in this movie. He is just brilliant in the scenes of re-collecting the joyous moments of those golden days of “Kamalini” as much as in the confronting and argumentative scenes with his son Prakash. Parambrata Chatterjee with his superlative acting skills is again outstanding as Prakash. Sohini Sarkar as Moumita ( Prakash’s wife) and Arun Guhathakurta as Hari live up to the expectation to portray two difficult sensitive characters with masterly ease and comfort. 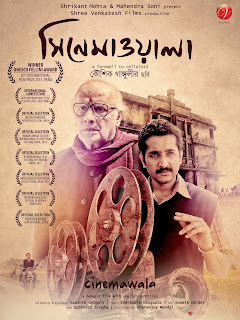 “Cinemawala” is a director’s movie crafted by Kaushik Ganguly with a simple but thought provoking narrative that holds the audience till the end. The movie is based on a contemporary issue and the director never tries to find the answer but throws the questions to the audience with powerful supportive statements. The cinematography of Soumik Haldar fits perfectly with the pace of the movie, which is also smartly edited by Subhajit Singha. “Cinemawala” has won five awards, including Best Film and Best Director in the “Filmfare Awards East 2017” in India.